Here is how I sew cuffs on baby pants. I take a strip of contrasting fabric and fold in half and iron. Then open. 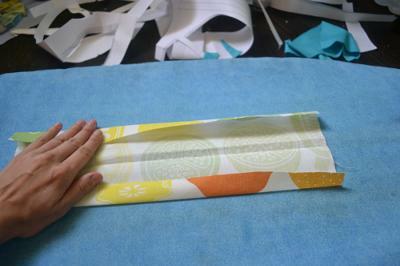 Next I fold down the outer edge to the center folded line and iron. This creates your own handmade double fold bias tape basically! The width of your baby pants cuffs really depends on the width of fabric you start with so keep that in mind. 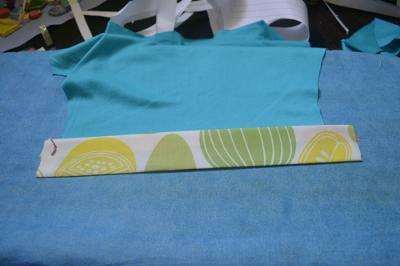 Then you basically insert the bottom of the baby pant leg into the fold of the homemade bias tape and sew. This creates a nice finish on both sides of your pants, which means you can fold them up and cuff them when the baby is small and then put them down as baby gets taller. This way, you can get a LOT of wear out of your homemade baby pants! Which is especially great since babies usually grow just in length. The same pants can last for a VERY long time this way! 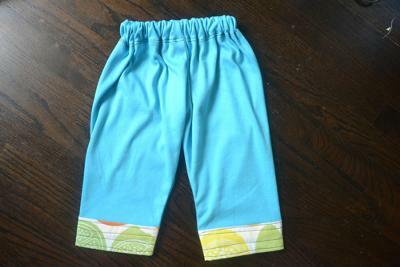 These blue pants were made using the free baby pants pattern on this site. 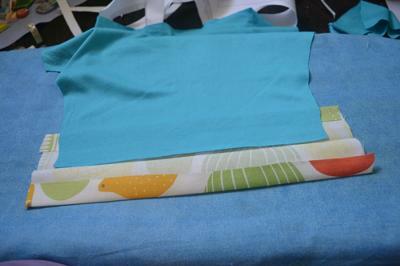 I used cotton stretch jersey for the blue and the cuffs were made from vintage cotton curtain fabric! It's pretty good information and it's pleasure to read to gain more knowledge. The good advantages of this article is giving good thought to each and every readers and also it's giving good impressions. So if you have any plan to write any future article and they can assist this best essay writing service for getting enough guidelines. fast essay writing service market lot of good variety for that. do my essay for me comfortable so many baby pants there in the market but there is a different look for that. Beautiful product you have shared with us, the picture of Baby Pants you have shared with us. I have visited this post First time, so I want to say thanks for sharing this post. Your post is very amazing i like it very much because it will help those parents who wants to sew their childrens pants by own so they can get information from this site easily. פוסט מצוין ששיתפת איתנו. אני לא נהניתי לקרוא אותו, אני אהיה בטוח סימנייה הבלוג שלך. זה באמת נחמד מאוד ועשית עבודה נהדרת. אני סימנייה הפוסט הזה ואני חוזר בעתיד. Actually preparing and sewing baby stuffs are really full of excitement as the mother do it with full of love and that to for the lovely baby. But we should more concerned about skin problems of baby that occurs due to the unhygienic stuffs . That stuff is created with the different perspective and truly beneficial for me. http://www.londonbricks-uk.co.uk/ it is the url of a great website. I have also shared this great website with my friends. Very nice post about baby stuff,i like reading it.I appreciate your efforts in making this post. Great post,you have work hard in making this post.I like reading the post. I always like college workshops! Here is a resource for you guys that will help you to pass all your university tasks write essay uk! http://royalessays.co.uk/buy_essay here you can order an essay for university. http://royalessays.co.uk/buy_essay - here you can order an essay for university! I have so many people for write these essay writing books and content writing services. Every content must have knowledgeable best paper writing services and best educational reviews in this blog. So, I am very happy for utilizing these online essay services. I appreciate the one who developed this particular australian writings.com review and this is really useful along with useful to individuals practice with essay writing. Thank you quite definitely for expressing the wonderful thoughts for us. Sewing cuffs on baby pants is actually quite easy, there's no need for special sewing techniques. 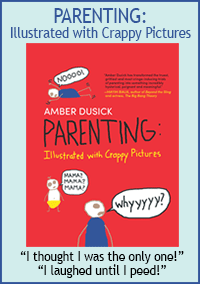 If any mom can do this and much more, it doesn't mean they must do everything. For instance, hiring the best children’s entertainer in Princeton, NJ to create a captivating party atmosphere sounds like a perfect choice, not only for the mom, but also for the celebrated and his guests. Absolutely lovely! I'm new to machine sewing,njust got my first one, a few days ago, and I'm already hooked! I wanna sew aaaaaaall day long, lol. My first project is a duvet cover for my 10yo, and some stripes to tie his curtains open... I'm almost done. Next, I'll make some of these gorgeous baby pants for my 16mo girl - I'll repurpose those flannel-ish baby blankets I have from when she was smaller... And we have no use for them! Winter is here, she grows too fast, and this will be perfect for pajama time! My baby grows taller but not bigger so I have tons of pants I'd love to add material to for lengthening. My question is how do you sew the cuffs on without sewing through the other side? Even when I pull the thing off the bottom of my machine (I'm new to sewing and have no idea what it's called) - it is still too big to fit the bottom of the leg around.